This is me in 1972 just a few months before entering junior high. 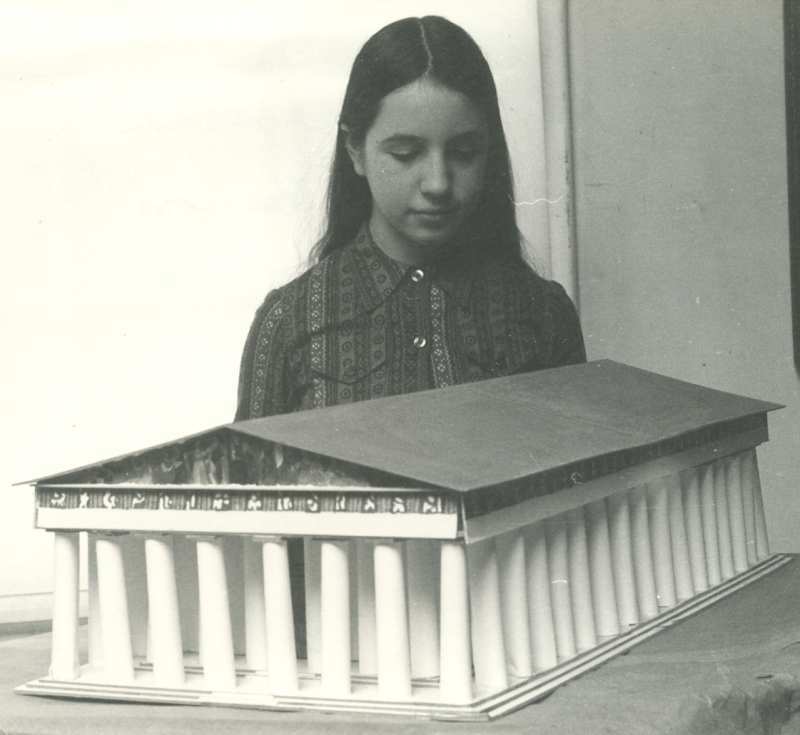 I’m shyly posing with my to-scale handmade model of the Parthenon. You can see that I was what they’d call today a geeky kid – thoughtful, sensitive – not a tough nut. At the time that Burroughs was built about 4 years earlier it was meant to be a revolution in education – take the sheltered middle class kids and mix them with the rough tough kids and things will even out. However the experiment didn’t go well – at least not while my sister or I were there… gangs of kids controlled the halls with violence (I only went to the washroom once at Burrough’s – it was too scary to be alone in the halls and bathrooms) and tormented kids on the buses. This is my old alma mater Burroughs Junior High in Yonkers, NY. 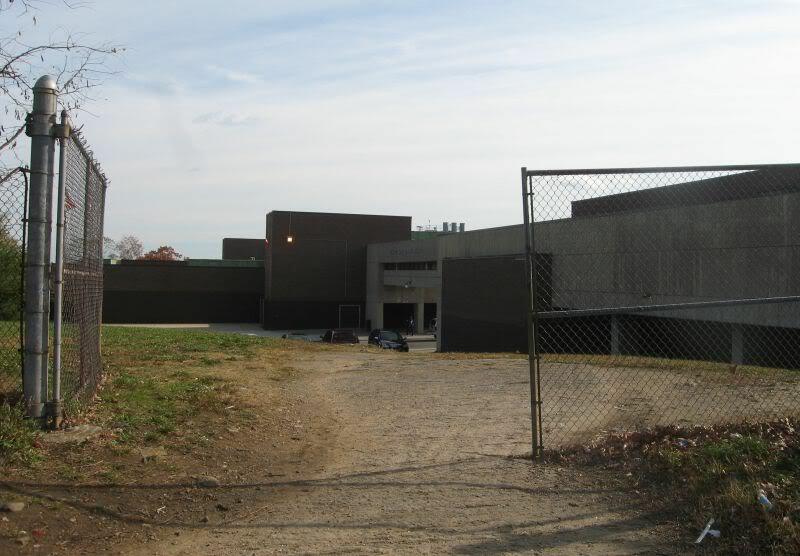 Isn’t it an attractive prison-like depressing institution? And one day a mobile race riot came (they were going around in buses) and our school was then surrounded by riot police decked out with all their gear and vans… it was a fun place. This is sweet me with Babby the neighborhood Tabby. Things in Manhattan were really devolving too – check out the movie American Gangster by Ridley Scott if you want an atmospheric tour of what it felt like in the city in the 70s. And in our neighborhood a Mafioso boss broke building codes and built a house across the street from our house and trucks came and went at all hours as did big men (think the Sopranos). We heard from a neighbor soon after we left Bronxville that the guy’s pretty little wife was killed by a car bomb. And there was a new presence of drugs in the schools and on our quiet streets – I went out to school one day and found a whole pile of used needles on the slope of our yard near the sidewalk…. My parents had been talking about moving somewhere remote and away from New York for a few years. Real estate catalogues from Ireland, Australia and the rural US, were lying around the house. 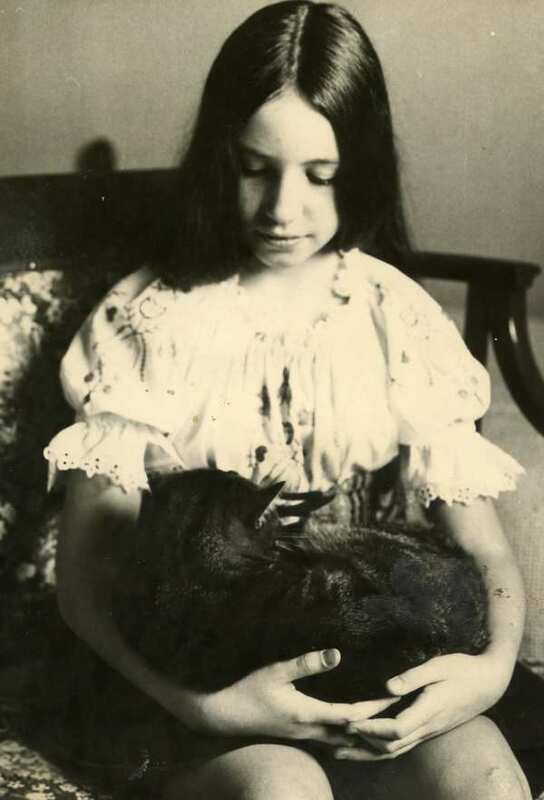 Even though I hated my new junior high – I didn’t want to leave my home, my Nanny who lived next door, or my beloved Babby, our visiting tabby. In the spring of1972 my parents decided to go up to Eastern Canada and visit my mother’s eldest sister Joanne and her husband Lorne, and look for some cheap rural real estate that we could move to. This is how my sister first saw the red house on the hill – from a canoe on Long Lake. 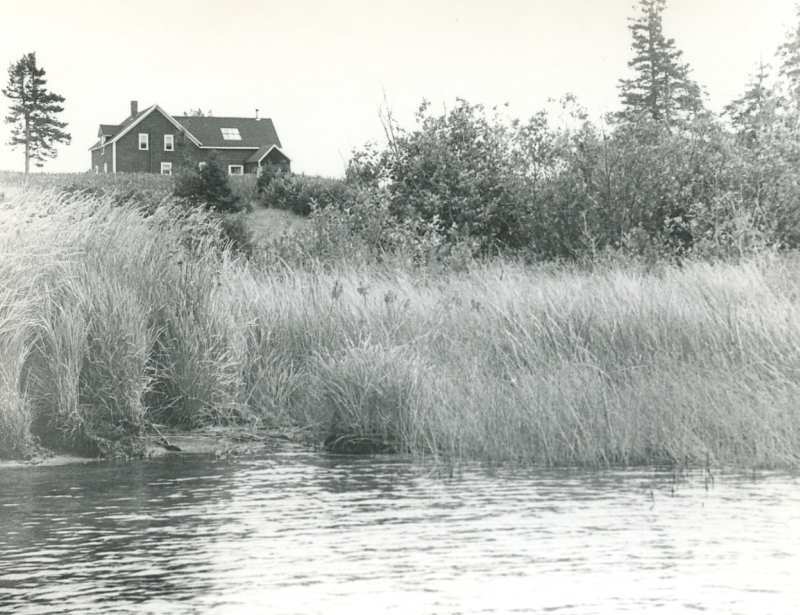 After looking at several remote houses on a windy and open marsh, and a couple of Victorian charmers in small towns, they quickly decided on a red farmhouse about 3 or 4 miles from my aunt’s farmhouse in Jolicure, New Brunswick. This was the house that my sister fell in love with about a year earlier when she was up there visiting. Locally it was known as the Willy Rayworth House. It had been famous for its spring water and for the dancing parties that had been held in the large kitchen in its heyday. The house when we saw it had been abandoned for some years and looked pretty in a shabby, run-down kind of way. I guess I didn’t realize at the time that we were going to move to this house forever more. So it came as a shock when it became a reality. I remember lying under the Christmas tree in 1972 looking up at the flashing lights and weeping because I didn’t want to leave, and my father yelling at me to stop – we were moving and that was final. In one of my first posts (Posing Old Testament Style) I bemoaned my lack of X factor while modeling, and believed that my disheveled appearance led my father to cover me up in a photographic shot in favor of my more distinguished mother and sister. 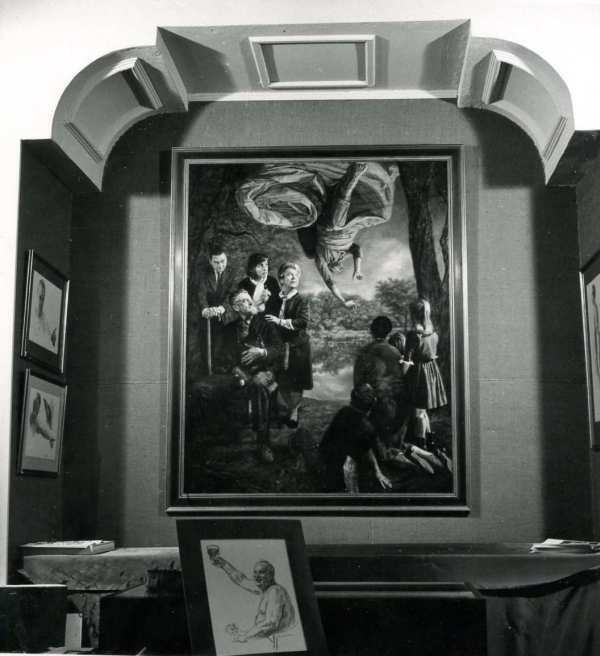 I found a photo taken at the Fitzgerald Gallery from my father’s first solo show in 1965 that shows a painting with this very group, including me, stunned by an angel appearing over us. My father is collapsed in shock in the foreground in front of my mother. I am still only a blob of hair – but there I am. I cannot find a title for this painting or any other reference for it in any of the ledgers or papers of my father’s. So I am assuming that it was destroyed after the show, not sold. If anyone can suggest what this is depicting I would really appreciate hearing from you – I have been trying to figure out what scene from the Old Testament this is of. Its interesting to see the other pieces that were for sale in the same area. I know the existence of one of the drawings of the angel on the left wall, but again have no record of sales for the other drawings shown in the room. Perhaps they were gifted. 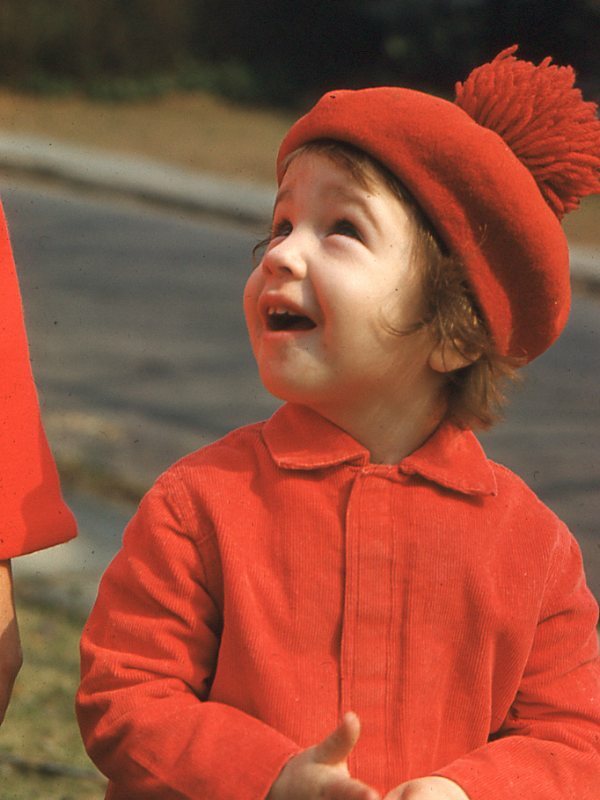 And… another wonderful surprise for me – I found a Kodachrome slide of a painting that I have to assume was destroyed, of myself and my sister based on that funny photo of me with my fly down. And here I thought I didn’t rate! 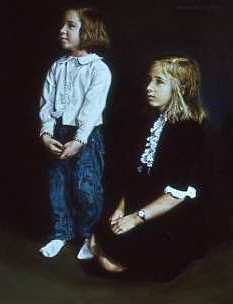 My sister and I in a painting, that as far as I can tell, did not go in the Fitzgerald Gallery show in 1965. So I guess I made the cut only so far as a painting was painted – it was probably destroyed by my father soon after it was created. I guess my Dad did appreciate my unique style. I have no idea if this was painted to be a portrait of us two girls or it was meant to depict something else. In any case, I am happy to find these last remaining images. … to be truly accepted for who I am… not in spite of my personal style but because of it! I will write more about the1965 show in upcoming posts. Stay tuned. 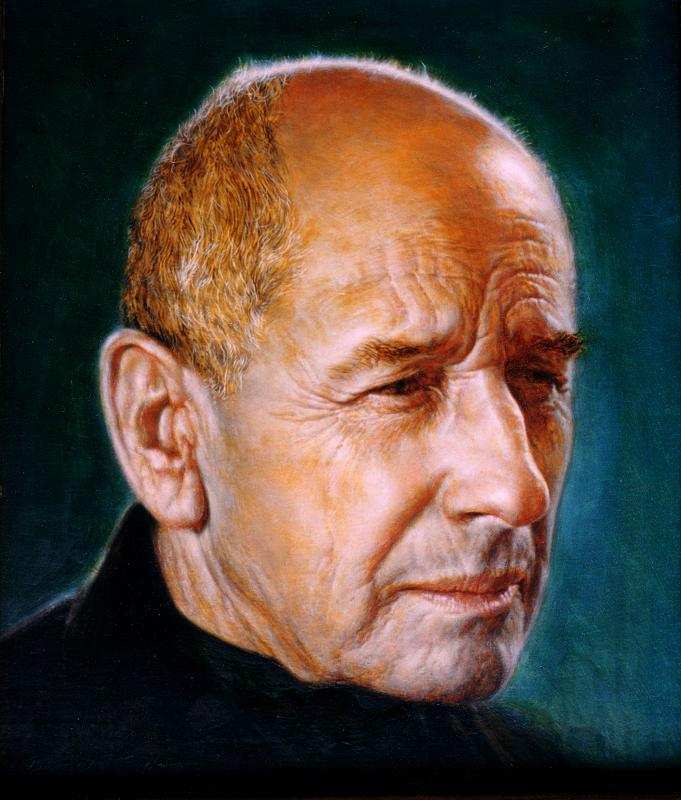 In December 1956 (just four years before I was born) my father Bernard Safran decided that after an intensive 6 months of self study of the Old Masters and painting portraits for practice in his Brooklyn neighborhood, he was ready to move up in the world and paint Time Magazine cover portraits. He painted a sample cover of General Ulysses S. Grant, the American Civil War hero and 18th President of the United States, with a non-objective background. This showed that he was capable of painting anything well and that he had a sound grasp of composition and color. For some reason he called Life Magazine first to get contact information, and serendipitously spoke with someone high up who was very genial and switched the call directly over to Ed Cerf, Senior Editor at Time Magazine. Mr. Cerf was polite but told my father he was busy that weekend and to leave his portfolio at his office. My father did that – the portfolio contained the portrait of Grant and a sampling of other works. A week went by and my Dad went back to see what happened. Apparently Cerf’s assistant had broken her ankle skiing and had been out all week recovering and nothing had happened with the portfolio. So he sweet talked a woman sitting near Cerf’s office to take the portrait straight into the Senior Editor right then and there. Cerf looked at the portrait and called my Dad in, and soon after my father became a Time cover artist. 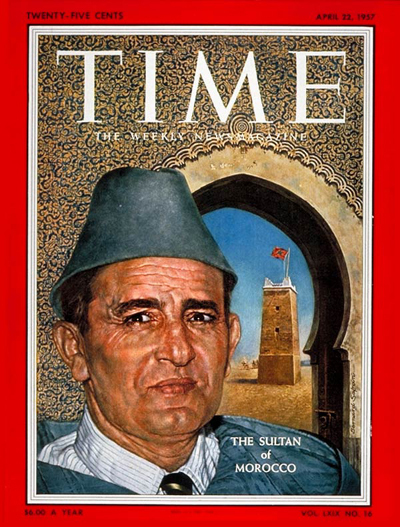 His first cover was of the Sultan of Morocco (edition April 22, 1957). When my father took in his finished cover portrait of the Sultan to a meeting of the senior editorial staff, the cover researcher was unsure that the red color that my father had painted was correct for the hat. Cerf instantly picked up the phone and called Time’s Paris office and had them send a man over to Morocco to find out what color the Sultan’s hat actually was. A few days later my father got a call and was told the Sultan’s hat was the same blue as his robe, so he repainted the hat just in time for publication. It must have cost the company several hundreds of dollars to get that one bit of information – and it really impressed my Dad. He was told that if he needed anything for source material, anything at all, to call and it would be made available to him asap. This was definitely a new way of working for him. My father who, for the previous ten years, was used to being paid measly amounts for commercial illustrations, was now paid the princely rate of $1500.00 a portrait. This was a huge step up for my Dad, not just financially but for his reputation as well. Time Magazine was one of the most influential weekly magazines back then and it had a world-wide distribution. Being one of their cover artists meant having your work seen by millions of people. 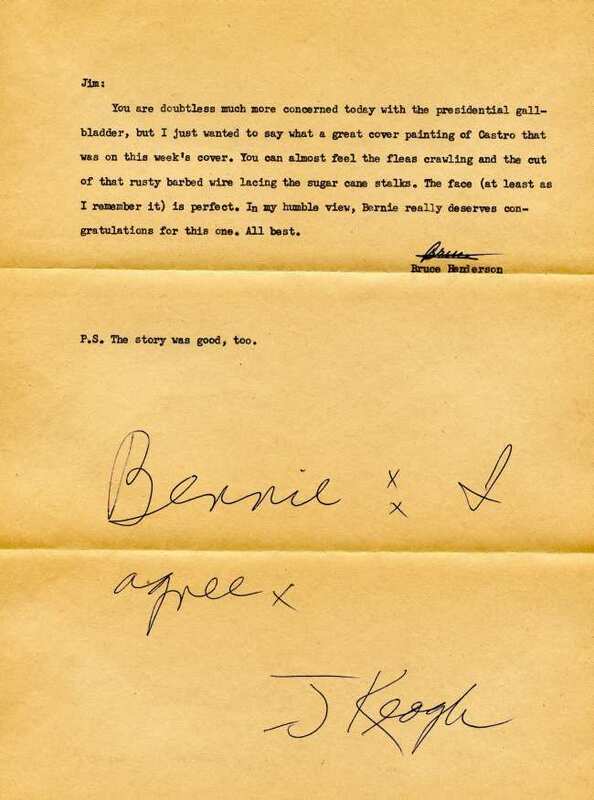 A fan letter from the influential businessman Bruce Henderson regarding Bernard Safran’s portrait of Fidel Castro. 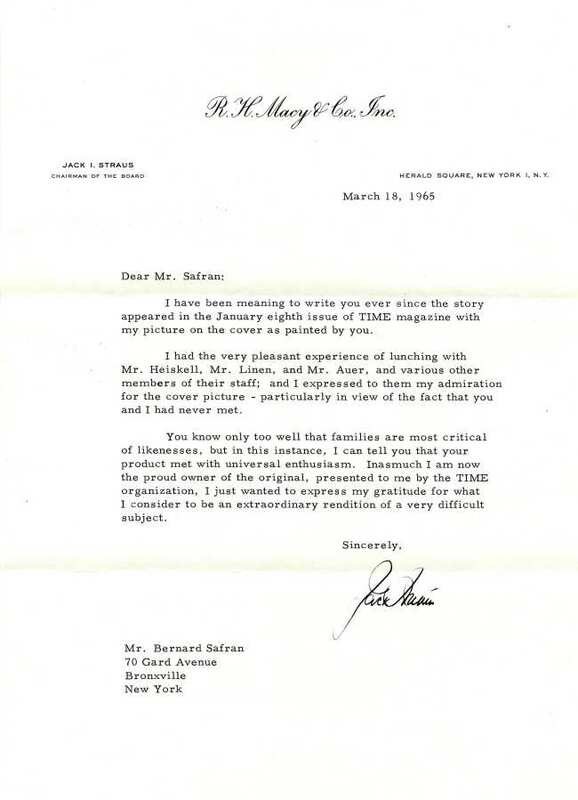 A glowing letter from Jack Strauss of Macy’s – he received the cover portrait by Bernard Safran as a gift from Time Magazine. He quickly became one of their top artists – his riveting paintings increased sales and a lot of people, including readers and those he painted, collected his covers and wrote fan mail about his work to the magazine. 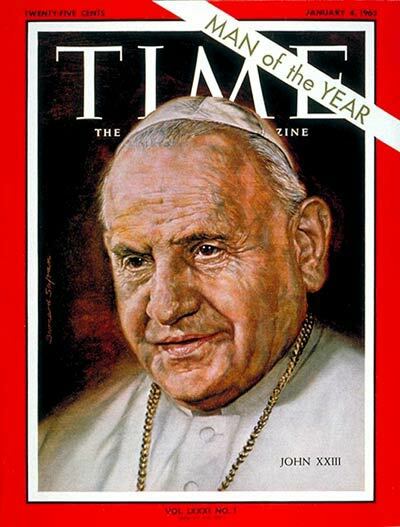 There are still paintings that he did for Time that are extremely popular even today, such as the one of Pope John XXIII which was the cover for the 1962 Man of the Year edition. 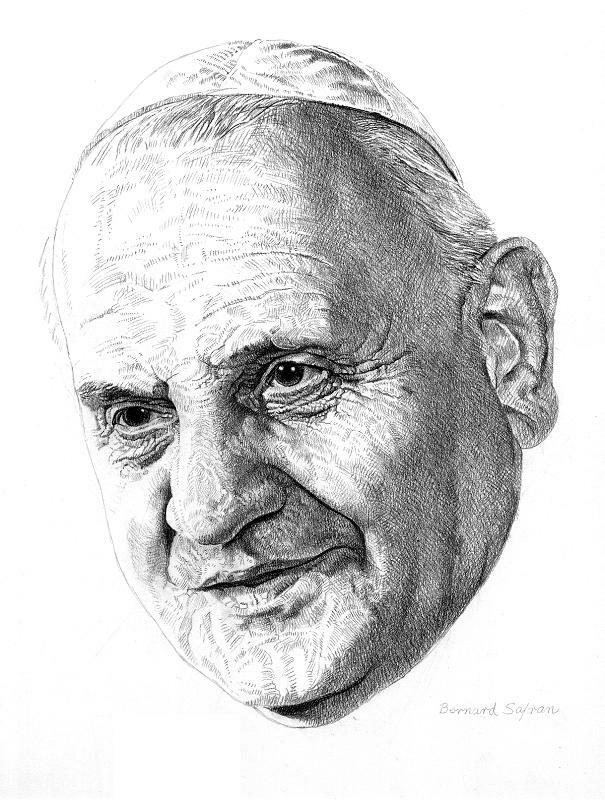 A study my father did of Pope John XXIII, completed sometime after the painting was published. Just after its publication, Time considered printing the portrait at its full size (17″ x 24″) because of the public demand to buy it. My father admired Pope John XXIII for the changes he brought with Vatican II. You can see this in the warmth and sincerity of the painting. Bernard Safran, Pope John XXIII, Time Magazine Man of the Year, oil on illustration board 1962. But somehow the original painting became badly damaged at the Time offices (deep long gashes were cut through the paint and into the board below) and the project was scrapped. When my father saw the damage he was very upset, and insisted on repairing it himself. He returned the portrait to Time, and it is now in the collection of the National Portrait Gallery in Washington, DC. One fan letter he got came from the Shah of Iran along with a personal gift engraved with the royal insignia, in thanks for the beautiful portrait my father painted of him. 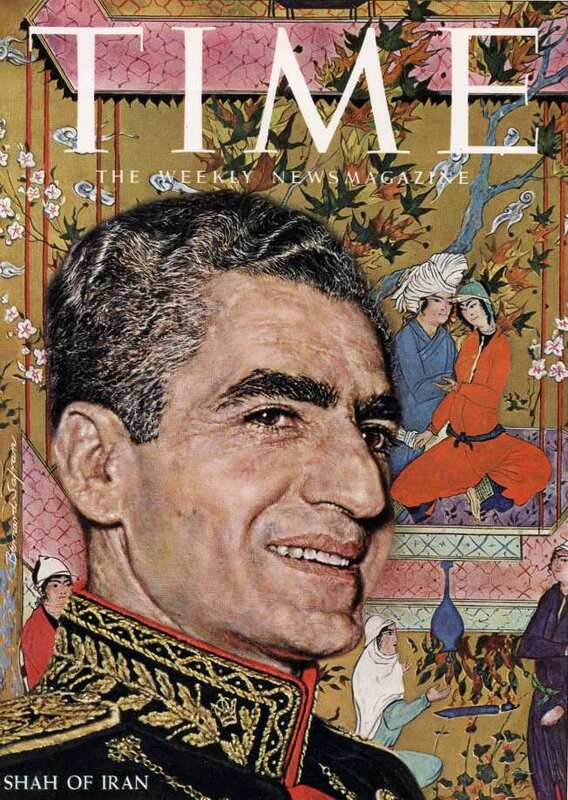 It’s likely that the original painting was given to the Shah after publication (a frequent practice – many of my father’s paintings were given away by Time executives). The painting has since disappeared, much like the Shah. 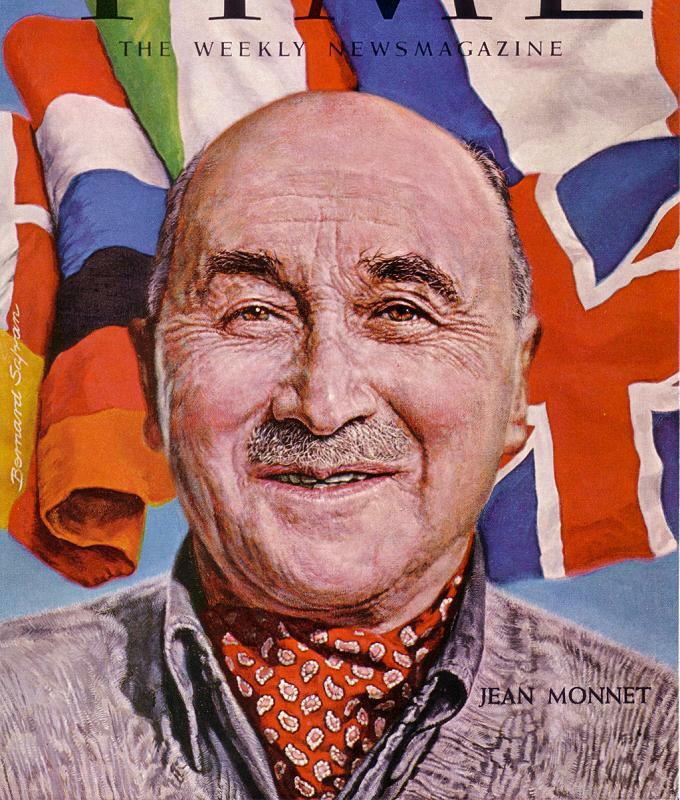 Another notable letter my father received was from Jean Monnet the founder of the European Foreign Market. Monnet thanked him for the great portrait (published October 6, 1961) and included an invitation to my father to visit with him at his office in Paris. My father took him up on this invitation in 1962 when we were all on a European holiday (more on that in another post). So my Dad went from being an overworked and underpaid artist – to being one of the most recognizable portrait painters in the world. These were his glory days – making money, having fame and social standing, being at the center of world news with real movers and shakers – it was a very heady time for him (no pun intended). I wrote earlier about how my family spent the fall, winter and spring going to museums in New York City to look at art collections. 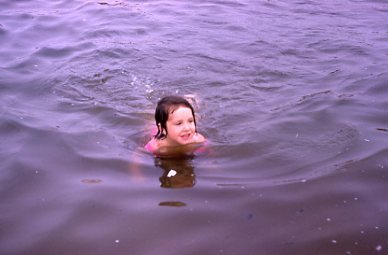 Well, in the late spring and all summer and maybe a bit of early fall – we went to the beach. 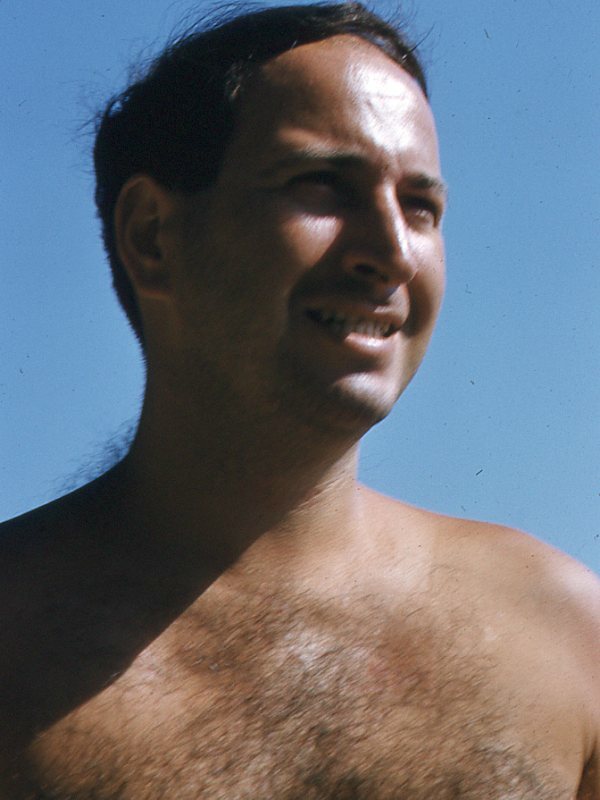 My father was a sun worshipper – he believed there was nothing healthier for you than a super duper excruciating bright red blistering sun burn. There was no such thing as sunscreen back then so every year we’d all burn. I remember not being able to sleep from the stinging heat of the burn – all we had was some Solarcaine to spray on (which has a drug in it to numb pain). When the burn started to peel, I did enjoy pulling long strips of skin off; the bigger and longer the better. Eventually we’d all tan and freckle to a deep hearty color – my father turned a spectacular mahogany. 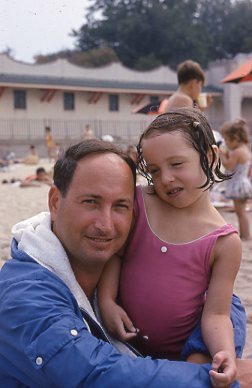 My Dad was happiest at the beach because 1. he suffered from eczema and the sun helped clear it up a lot, and 2. his happiest childhood memories were summers spent at Rockaway Beach, so he felt more relaxed at the beach than anywhere else. (it happens to me too now – the beach is like a Neuralyzer for me). Rye Beach was very festive. 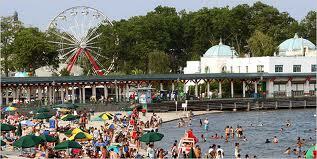 It is located on Long Island Sound. One of the regular places we went was Rye Beach in Westchester County. Rye Beach was a pleasant drive from our house, maybe about 10 miles. It was a very fun place to go (and probably still is). 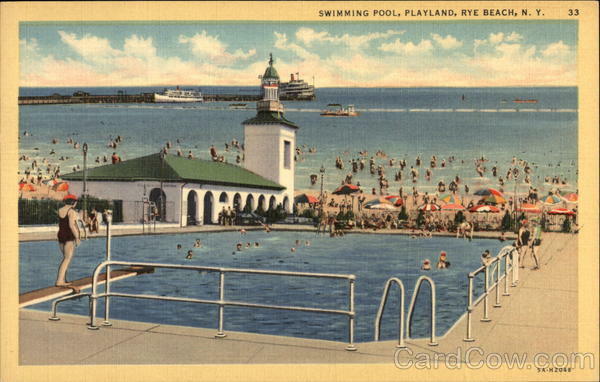 There was a swimming pool for those who prefer chlorine to salt water (I got to swim in it once that I remember), a long boardwalk with lots of fun booths with games and foods, a long dock for loud booming ferries (I called one ferry the Noisy Boat as a kid because its horn was deafening) and of course Playland – an enchanting amusement park. When I was little and my Dad still felt flush with money – we would sometimes get Italian Ices from the Boardwalk or ice creams from some guy who walked around with them for sale. And a couple of times we even went to the amusement park – the scene of a tragic occurrence where I lost my red pom pom hat on the kiddie roller coaster, never to be found again. That ended the day with tears and I never forgave that roller coaster or went on it again. 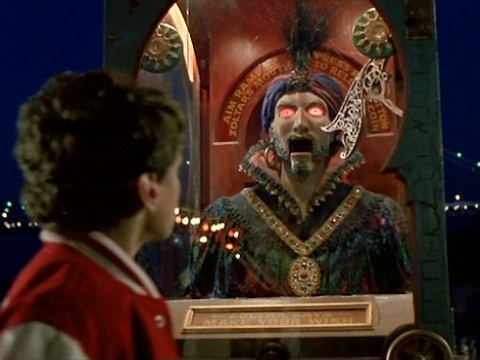 One thing my Dad never forked over money for was the magic, scary, mystical fortune telling Zoltar. 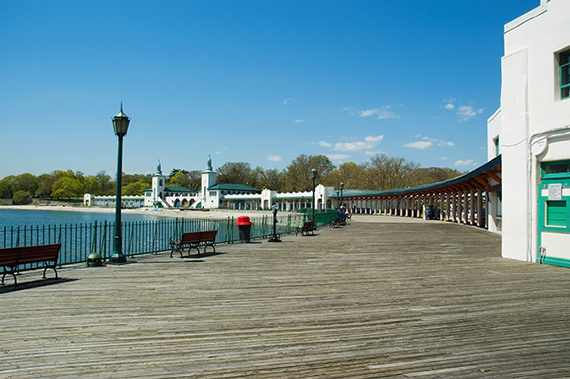 When I saw the movie Big as an adult it was a rush – first off I knew Zoltar right from the start – that was the guy I was always terrified of, but drawn to, at Rye Beach… then when the movie actually ended at Rye Beach I nearly burst in the movie theater! Zoltar! my Zoltar was in the movie! (only they’d moved him a bit from where he’d been when I was a kid). Too bad my Dad was too cheap to pay to get my fortune – I might have had a life as a Fairy princess or Japanese princess or maybe both. 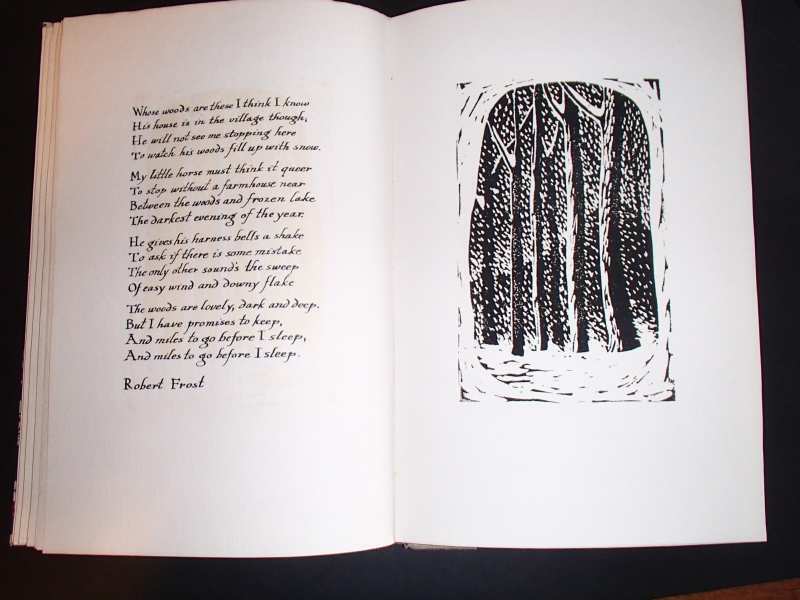 The first book that my mother made by hand was a book of poems. My Mom’s work room was in the basement of our house. The stairs down to the basement divided the space in equal parts. On the left was a card table that my mother used to do all her work; on the right by the furnace was where my father had a darkroom set up. The rest of the basement was for drying laundry and storing the usual tools and things. Mom I’m bored…. I’m told that I bounced and danced everywhere, a bad combination when someone is trying to do calligraphy on a shaky card table. It must have been exquisitely hard for my Mom not to yell at me. … moving the table as she worked, leaning in to see what she was doing (my nose under her nose), playing around with her linoleum tools and calligraphy pens. She never yelled at me, but would patiently ask me to leave if I was too much. More often she’d give me something to do along side her or in my room so that I would be engaged and quiet(er). She even let me use the super sharp cutting tools to make my own linoleum cuts on small scraps. Mom used our Betsy McCall Designer light table to do her calligraphy (it was meant for designing paper doll clothes). She’d tape a darkly lined paper onto the area that lit up, and then place her good paper over top so that she could see the lines through it and make her words and sentences straight. 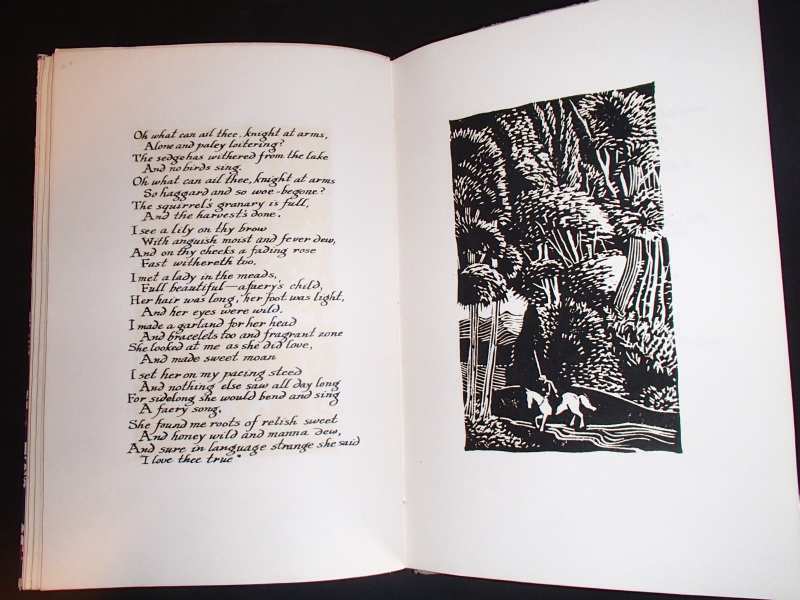 She illustrated every poem with a unique lino cut. I had my favorite pictures when I was a kid, and obviously my favorite poems. I was less inclined to like the poems about death and sadness – but the book wasn’t meant to be a child’s book – it was meant to be cherished throughout my life. And I do cherish it. 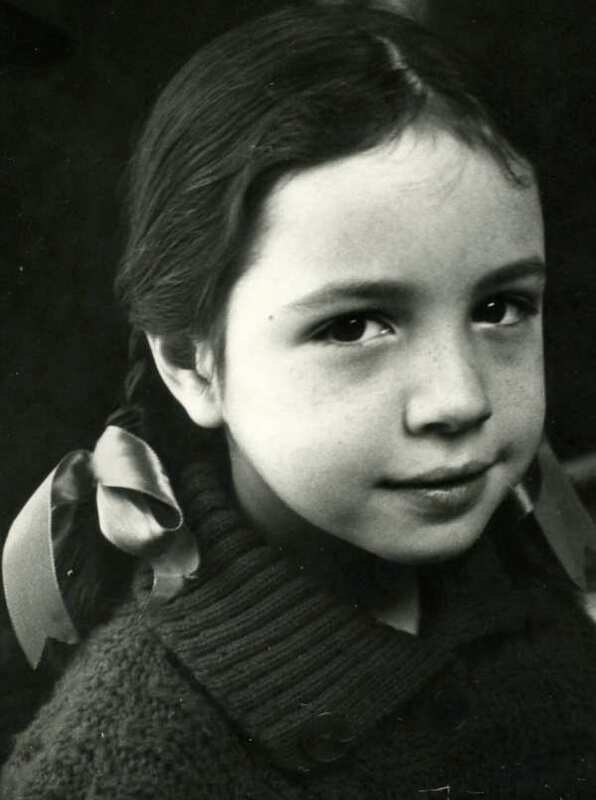 My mother Adele had a spirited and fearless appetite for learning. She approached everything in life with zest and when she set her mind to it she could do just about anything…she was an inspiration to me. 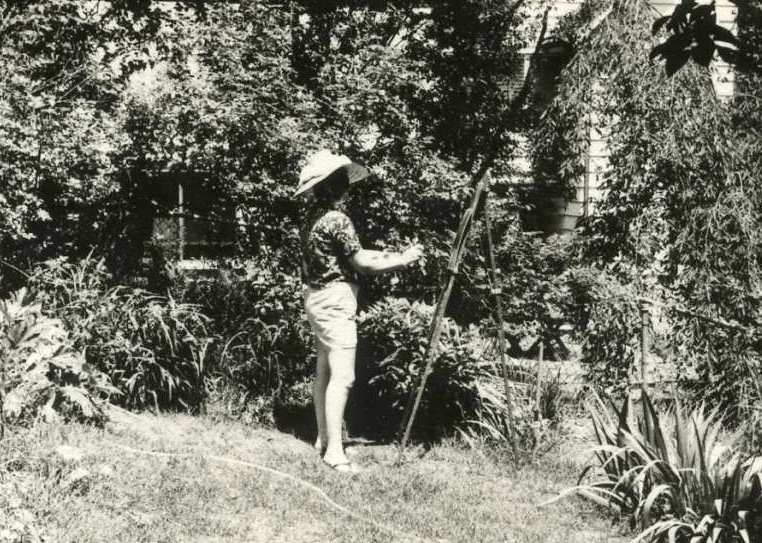 Here’s my Mom painting in the garden at her small easel, wearing her big straw beach hat and standing in her flip flops. She was first and foremost a painter. 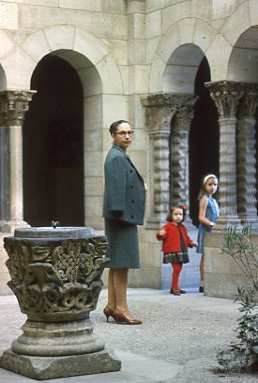 When I was little and she was busy rearing us kids, she pursued a variety of creative interests. It was during this time that she decided to learn calligraphy, print making (with linoleum cuts), and book binding. She started by teaching herself all about calligraphy. 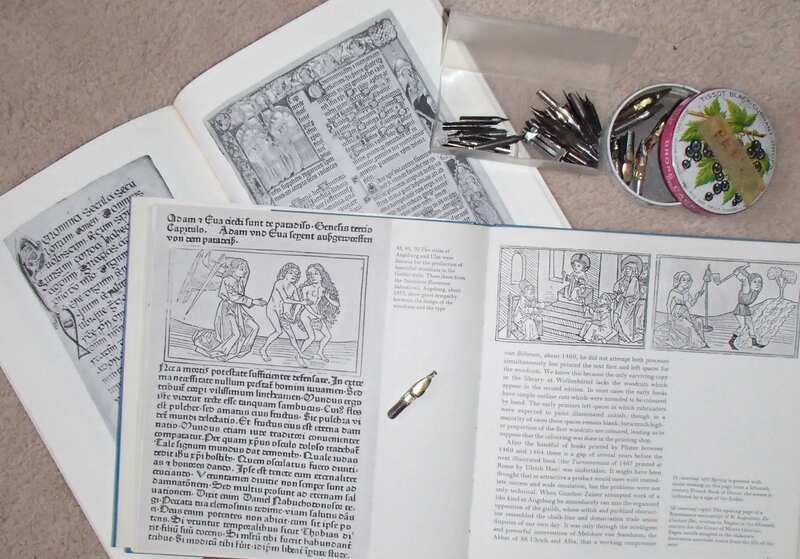 A couple of my mother’s books about Medieval manuscripts, and some of the pen nibs she used for making her own manuscripts. She studied Medieval illuminated manuscripts, and different handwritten alphabets until she found a style that she could make her own. In the beginning I remember she used feathers to make her pens – I think they must have been goose feathers – they were big and sturdy and white. She cut the tip of the feather at the exact angle for it to fill with ink and to make it form the right width of line as she wrote out text. Eventually she started using a pen that had interchangeable nibs. The pen was easier to use than feathers, but it was still a very difficult thing to do properly. It took a lot of practicing to get the right style so that she could form the letters without thinking too much. The letters needed to look even and balanced and have a visual rhythm to them. 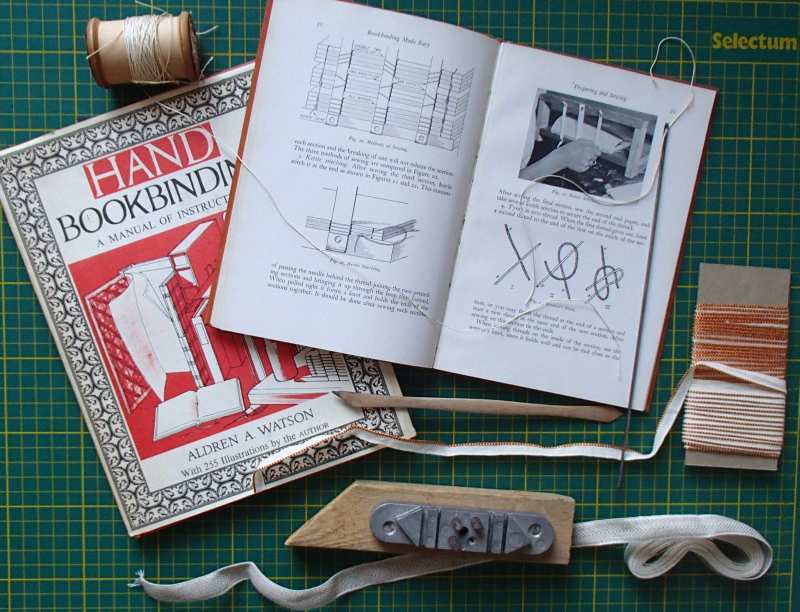 It wasn’t enough for her to just learn calligraphy – she also learned how to bind the pages she made into books. She decided to make a book of her favorite poems – and to make three copies of it by hand; one for my grandmother, one for my sister, and one for me (more on this book in an upcoming post). 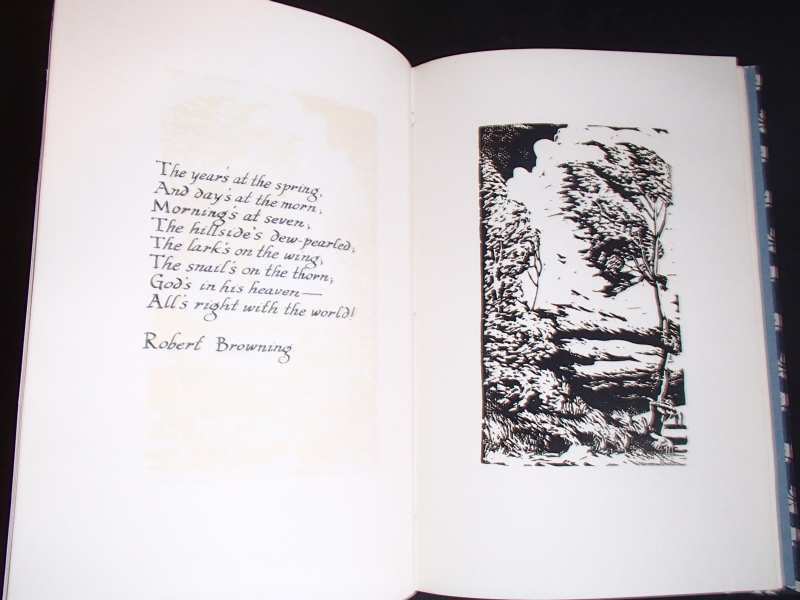 To illustrate the book she made a different linoleum cut for each poem. 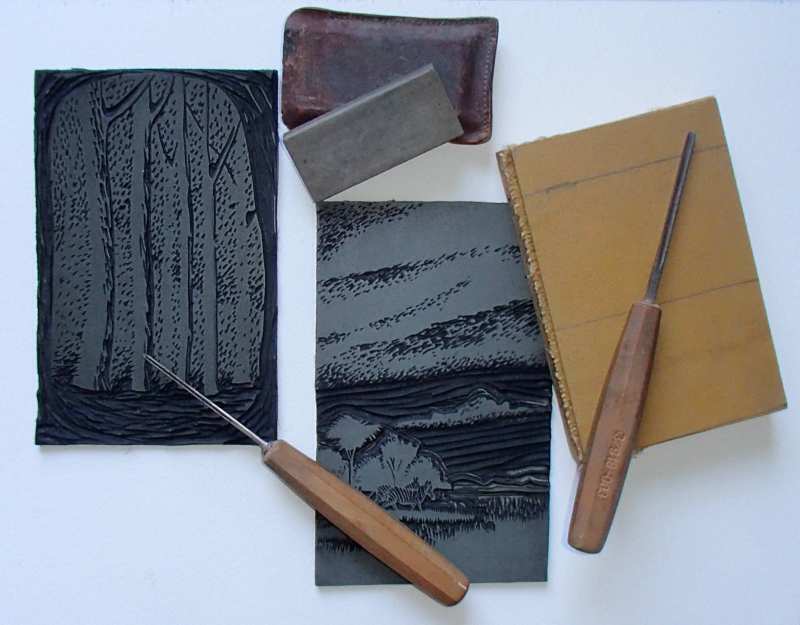 Two of Adele’s linoleum cuts for her book of poetry and two cutting tools, one plain mounted piece of linoleum and a sharpening stone. Like many print making processes – its the area that you don’t carve away that will pick up the ink and make the final design you see on paper. The prints will be the opposite of how they appear here (light will be dark; dark will be light). She printed each picture by hand, using a large smooth spoon to rub the ink from the lino block onto paper. 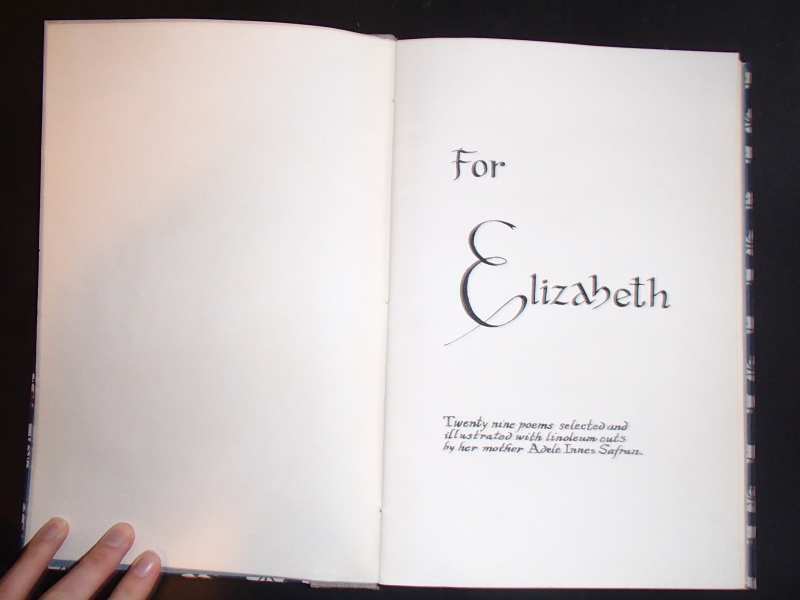 (She later bought an etchings press and a font of type to use for making other books). One of our neighbors in Bronxville was Mr. Valenti Angelo. Mr. Angelo was a famous artist, book illustrator and author and he helped my mother learn how to make and bind books; it was very generous of him. My mother took me to Mr. Angelo’s house on several occasions. Mrs. Angelo would make tea or lemonade and we’d sit and visit for a few minutes in the garden or the living room before going upstairs to his studio where he kept his printing presses and his beautiful paintings. This is a portrait of Mr. Angelo that my father did in 1968. My parents used to say that Mr. Angelo had a fine head – meaning that he had great character and personality, and that he was a handsome man. He would let me look at books that he’d written and illustrated while he talked to my mother. 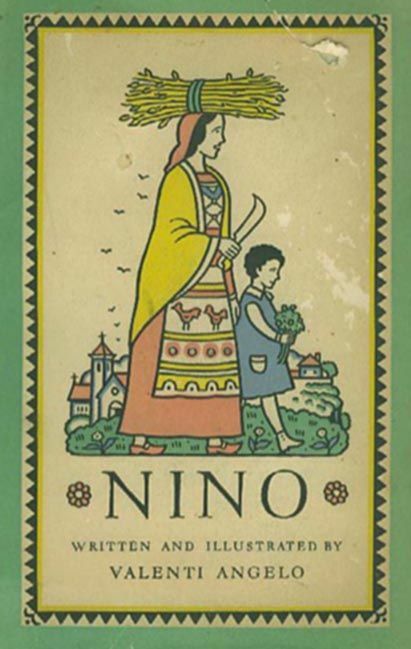 I remember liking his children’s book Nino so much that he gave me a copy. 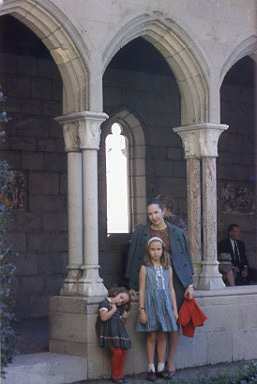 There’s no doubt that going to The Cloisters when I was a kid cemented my love of Medieval art forever. The Cloisters very successfully evokes a contemplative feeling with its stained glass windows, its stone walls, walkways, chapels and colonnaded gardens and the amazing collection of Medieval art and furnishings. It’s peaceful and lovely, and people visiting it are conspicuously aware and respectful of the meditative atmosphere. 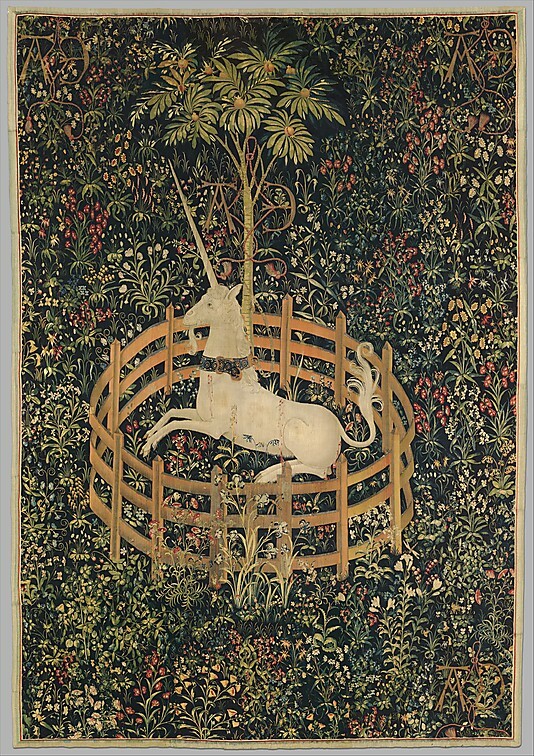 The masterpieces I loved the most at the Cloisters were The Unicorn Tapestries; the most beautiful Medieval hangings in the world (at least in my opinion). 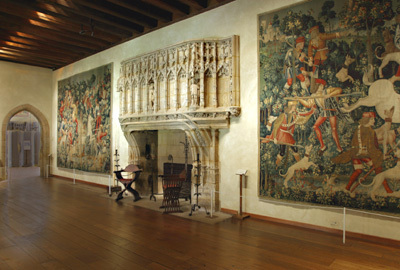 The seven tapestries of the series show the Unicorn being hunted and caught by elegant men and women, including the requisite virgin. There are horses and hounds, and wild animals, as well as a multitude of flowers and trees- all in exquisite detail and subtle colors. Even as a child I appreciated the work that went into them – it seemed almost impossible to me that people could ever make anything so fine. There is a fairy tale element of romance to these beautiful images despite the savagery of the hunt. Their intended Christian message meant little to me – I was transfixed by the beautiful animals, clothes, scenery and the drama of it all. And because they were so convincingly life like, it was easy for me to make believe that the tapestries were showing something that really happened. I mentioned in an earlier post how I enjoyed playing games of look and see in museums and Medieval art is especially rich in imagery – animals, plants, strange demons, and tortured saints. I ate it all up and delighted in the details. 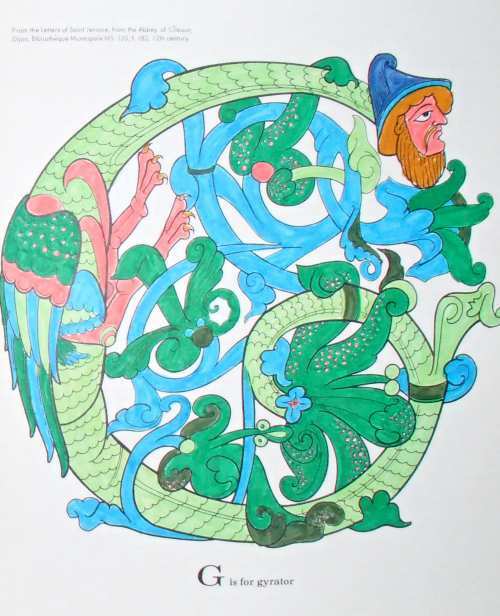 I was an early Medievalist – this is from my coloring book of Illuminated Initials. 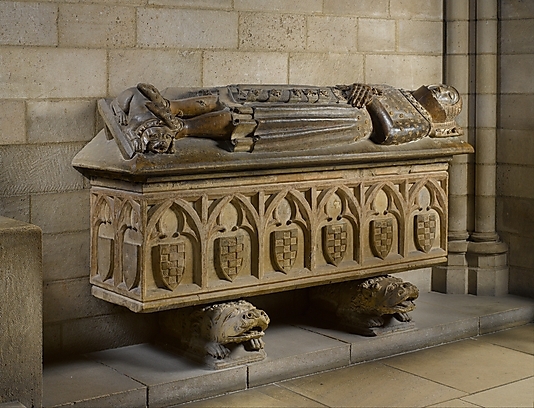 Here’s a lovely example of something I really enjoyed (and still do) – Medieval tombs. This has a wonderful portrait of the Count of Urgell at peace (a great name), he’s wearing an interesting Medieval outfit including his sword and armor. 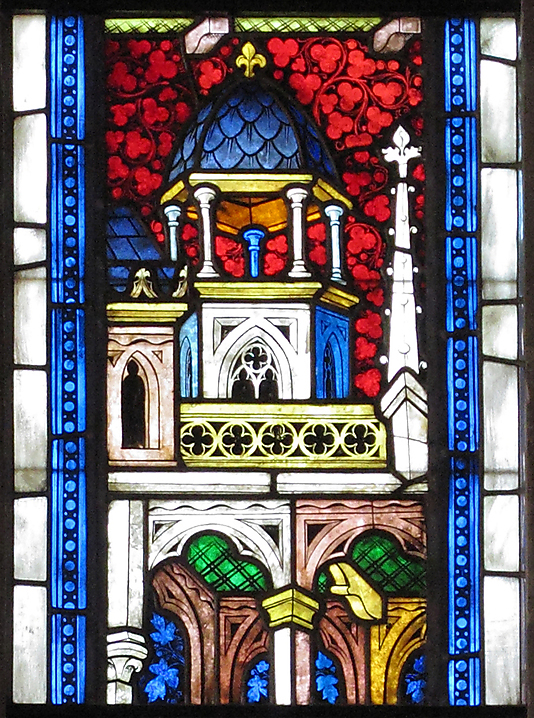 And there are animals – a beloved doggy warming the fellow’s feet in the afterlife, and two beasties holding up everything and a small servant holding up his head. Its very charming for a big stone box that someone was buried in. What child wouldn’t like looking at this little carving? 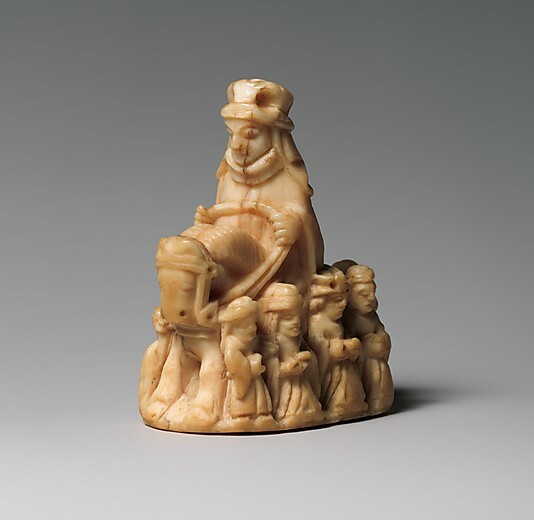 Its an ivory chess piece of a Queen on a gentle horse and little Medieval people all around her – maybe they are lining the street throwing rose petals as she passes. Think about living in a brilliant and magical city with buildings like this – my mind was constantly filled with fairy tales and fanciful places to go. The brilliant colors and the very clear graphic lines of this panel are strikingly beautiful. I loved looking at the carved statues of Saints; each with their own story of terrifying suffering. This is Saint Roch. He’s showing us with his pant less and cold looking legs, the last Bubonic bubo on his thigh. His faithful dog has licked his yucky sores and helped save his life, so its only right that he give his dog a bun. 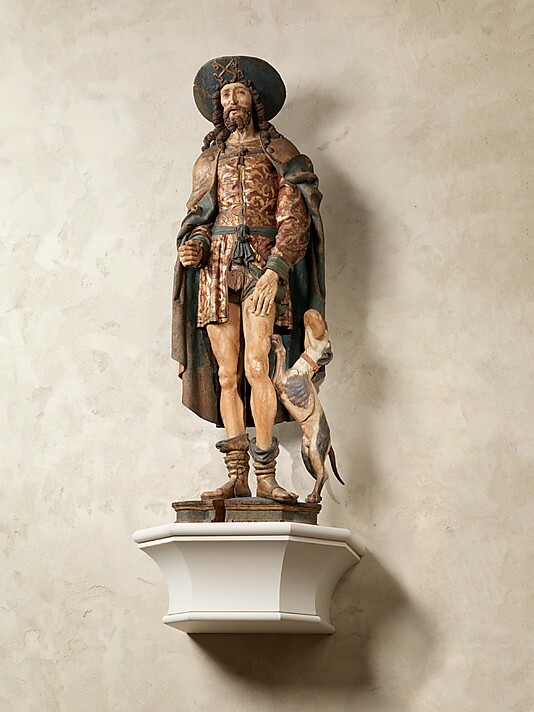 St Roch tirelessly tended the sick and starving in his short life.